A purifying serum that nourishes and softens the damaged scalp. 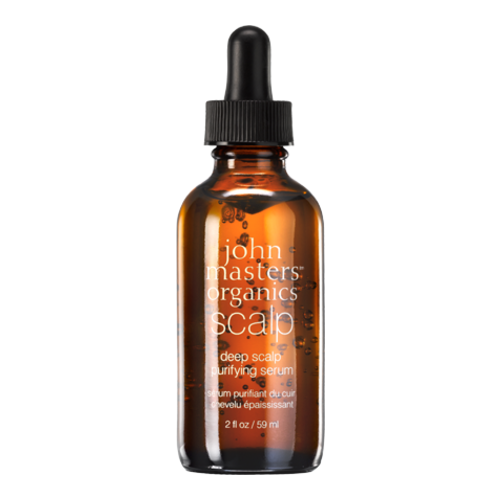 Establish balance for a healthy scalp with John Masters Organics' Deep Scalp Purifying Serum that harnesses the natural properties of cooling spearmint and peppermint, natural-astringent meadowsweet extract and strengthening vitamin B complex. This revitalizing formula helps to detoxify, purify and nourish the scalp and restore hair health. • Massage evenly into scalp and leave in. This product can be shipped to any country eSkinStore currently ships to. shipping rates, options, and exceptions. You will receive an email if any items from your order are currently out-of-stock with an Estimated Time of Availability (ETA). For larger orders - shipped to USA and Canada addresses - we may split your order at no additional shipping charge and ship all available items. All out of stock items will be shipped separately in the last and second shipment once they are available. All International and small orders (Less than $200 to $300), will ship as soon as the out-of-stock item becomes available. In case you wish to split your order additional shipping charges may apply after and your order may be split after we receive your confirmation of acceptance of the additional shipping charge. If you have questions, please contact Customer Support. For orders arriving at a HOTEL, please select the Express Shipping option. Delivery times cannot be guaranteed. 1- Only local residents (Greater Vancouver, British Columbia, Canada) may select Store Pick-Up as a shipping option. You can call our customer support at 1-866-336-7546 to arrange a time for pick-up of purchases at the following address: 120 100 East 1st Street North Vancouver, B.C. V7L 1B1. 2- North America refers to only Canada and USA and not Mexico. 3- All International orders are labeled as Gift with a low value to avoid custom/duty charges. However, if the customs apply any duty charges at destination country customer is responsible to pay such charges. 4- All delivery times are estimates. In most cases, delivery is within the specified time. However, in rare cases, delivery may take longer due to unforeseen and uncontrollable circumstances. Expedited and regular mail do not have guaranteed delivery times. In very rare cases, if your order is not delivered within the above mentioned period, claims can be made 4 weeks after the shipping date through the local postal company. Once the claim is approved, a second shipment or store credit will be issued. There will be no extra shipping cost for the second shipment.